If you are considering the care and maintenance service of the trees on your property, you may wonder: Why should I hire an arborist to care for and service my trees? An arborist is a professional who studies and cares for trees. An arborist focuses on the health and safety of trees. An ISA certified arborist earns credentials from the International Society of Arboriculture. To receive certification, Arborists must pass test in tree biology, diagnosis, safety, and other areas involved in tree care. Hunter's Tree Service employs certified arborists to care for trees in Tacoma and the greater Western Washington area. Diagnose and Treatment: An arborist can diagnose and recommend treatment for diseased or damaged trees. Arborists are educated and experienced in caring for individual trees and will work to maintain the good health of your trees. Saving the tree is always the top priority for an arborist. Climbing and Pruning: An arborist is trained and experienced to safely and professionally conduct pruning of trees that require climbing. Climbing and pruning can be dangerous to both people and structures and should always be done by professional tree climbers. Storm Damage Assessment: If you are concerned about tree damage caused by a wind or ice storm, it is wise to stay clear of storm damaged trees until they have been assessed by an arborist. They can recommend tree removal or advise for treatment or pruning for safety. Consultation and Report Writing: Some arborist consultations need written reports. Common issues addressed: public safety, heritage trees, neighbor issues, roots impact, diseases and safety of nearby trees. An arborist can write a report regarding the trees on your commercial or residential property. If you are in need of an arborist for general care, tree removal, stump grinding, tree cutting and more in the Puget Sound area, Hunter's Tree Service has knowledgeable, certified arborists available to consult and service your trees at an affordable cost. 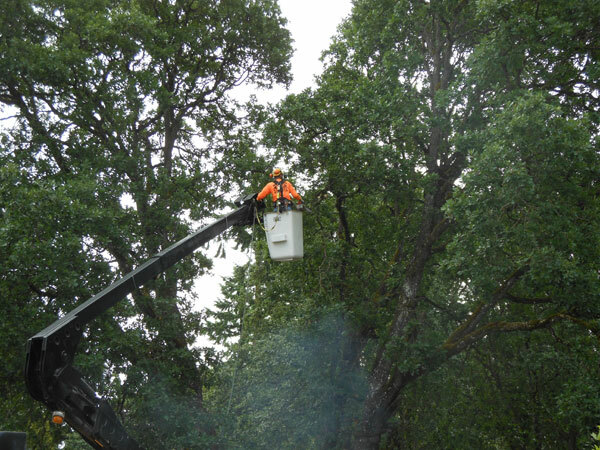 Hunter's Tree Service employs International Society of Arboriculture (ISA) Certified Arborists who professionally provide tree services in Western Washington. Call Hunter's Tree Service in Tacoma, WA to consult with an arborist today!